What is an MS4 and why is stormwater pollution control important? 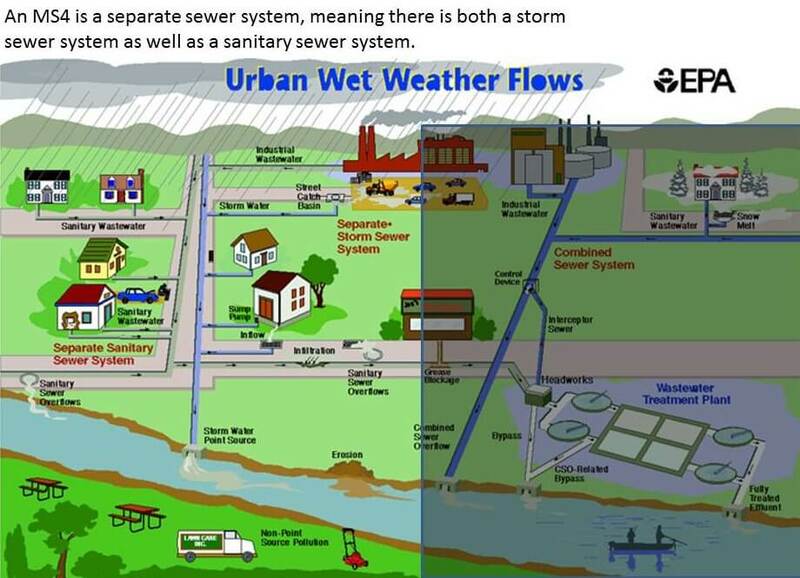 Municipal Separate Storm Sewer Systems (MS4s) are sewer systems which transport home wastewater separately from storm runoff water. Due to the structure of MS4s, it’s necessary to implement measures to reduce storm drain water pollutants including organic debris, litter, oil, sediment, and construction site runoff. In nature, rain water would naturally be filtered through the ground. However, now that roads and urban sprawls cover much of the landscape, water is prone to flow faster and pick up more debris along the way. Without stormwater pollution prevention programs in place, water runoff can and will over-saturate natural bodies of water with pollutants which directly harm wildlife, or which cause indirect harm with algal blooms, changes to the ecosystem, and flooding. How do street sweepers control water runoff pollution? Street sweepers don’t just improve an area’s appearances; they also collect solid debris before it can be washed down the drain and into rivers by rainwater. That said, merely sweeping without a plan won’t achieve all of the potential benefits that street sweepers have to offer. Which type of street sweeper is best for our MS4 program? Generally speaking, there are three varieties of street sweepers, categorized by their collection method. Sweeper brooms push and fling debris under the sweeper vehicle and onto a conveyor / elevator apparatus which lifts it into the hopper. 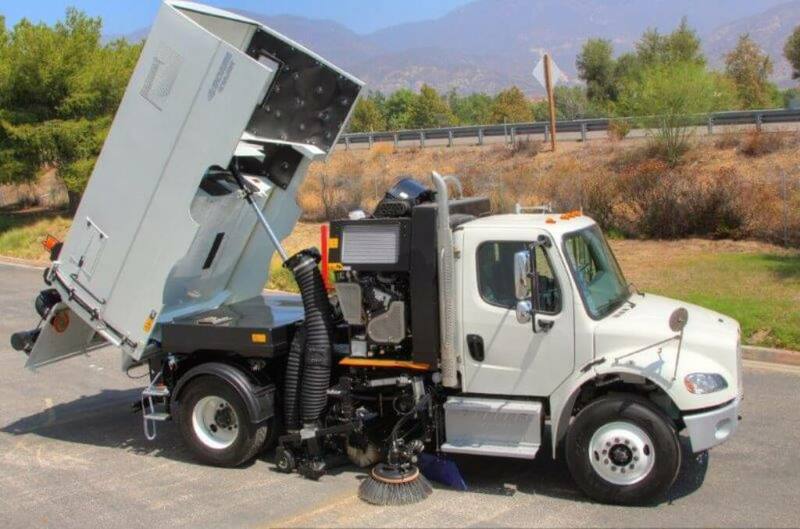 Mechanical street sweepers are just fine for picking up leaves, litter, and larger debris, but they aren’t your best option for keeping fine dust and sediment off the road. They’ll keep your streets looking nice, and they do offer some pollution-reduction benefits, but they aren’t designed to collect the tiniest particles. After debris is pushed under the sweeper by the brooms, a powerful vacuum aids in the collection of debris into the hopper. 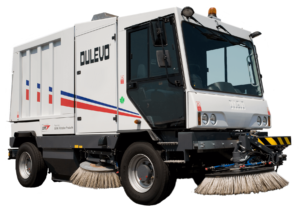 Sweepers with vacuum-assisted collection bring significant advantages in pollutant removal. As you would expect, these sweepers are able to pick up debris with ease, regardless of particle size. Regenerative air sweepers operate similarly to vacuum-assisted sweepers. They utilize powerful vacuums and directed airflow to pick up everything, both big and small. On top of the advantages of vacuum-assisted collection, regenerative air sweepers have the bonus of filtering vacuumed air and feeding it back into the vacuum. This means that tiny particles aren’t just being collected from the ground; they’re also being more securely trapped after collection, so even less fine dust ends up back in the air. The stormwater pollution reduction of regenerative air sweepers is slightly better than that of vacuum-assist sweepers which lack regenerative air systems. Thanks to their excellent air filtration, these sweepers are the best at picking up everything and preventing even the finest dust from escaping after collection. What are the best practices for reducing stormwater pollution with street sweeping? In general, the more often a road is swept, the better the results. At an absolute minimum, streets should be swept twice a year, but there are those who opt to sweep as often as biweekly or even daily, according to the location and time of year. 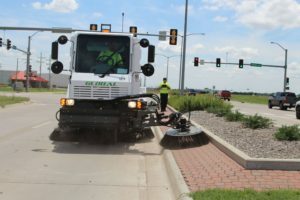 Sweeping has been shown to be more thorough if performed with two sweepers working in tandem, or with a single vehicle making a second pass over the same area. In the early spring, after the snow is gone, in order to pick up sand, rock salt, and other winter debris. In June, after trees have dropped their seeds and flowers. This particularly cuts down on the saturation of phosphorus in water runoff. In the fall, after leaves have fallen. It’s best to sweep in coordination with leaf collection, and to give priority to areas with large amounts of deciduous trees. If possible, in all cases, sweeping should be done before significant rain so that contaminants can be collected before they can be washed down the storm drains by the rain. Debris and pollutants tend to collect against the curbs of streets and edges of parking lots. Consider restricting parking in areas scheduled to be swept so that sweepers are able to access the portion of the road most in need of cleaning. 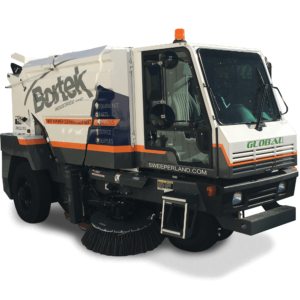 When buying or renting a street sweeper, consider whether your route would benefit from a sweeper with improved broom control. Plan your sweeping route efficiently. Areas to prioritize are those which drain into sensitive bodies of water, those with greater tree coverage, and (obviously) those which are the dirtiest in general. Also keep in mind the distance from the sweeping area to the dump site; time spent traveling to the dump site is time that could be better spent sweeping. Make sure your dump site is organized for proper waste disposal so your collected pollutants don’t just run off from another location and undo your progress. Even better, keep your sweepers out of the rain and wash them in a place where the any residual contaminants on the vehicles themselves won’t be washed into the storm drains.